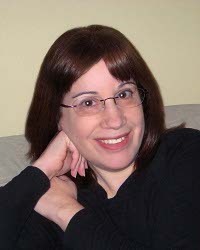 One of the front-runners in the crafty cozy writers, the crafty Lois Winston, is my guest today. I’m SO EXCITED to have her here! Award-winning author Lois Winston writes the critically acclaimed Anastasia Pollack Crafting Mystery series featuring magazine crafts editor and reluctant amateur sleuth Anastasia Pollack. 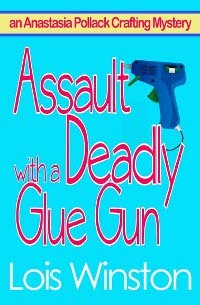 Assault With a Deadly Glue Gun, the first book in the series, received starred reviews from both Publishers Weekly and Booklist. Kirkus Reviews dubbed it, “North Jersey’s more mature answer to Stephanie Plum.” Other books in the series includes Death By Killer Mop Doll, Revenge of the Crafty Corpse, Decoupage Can Be Deadly and the ebook only mini-mysteries, Crewel Intentions and Mosaic Mayhem. Lois is also published in women’s fiction, romance, romantic suspense, and non-fiction under her own name and her Emma Carlyle pen name. In addition, she’s an award-winning craft and needlework designer. She often draws much of her source material for both her characters and plots from her experiences in the crafts industry. Lois just got her electronic rights back on her Anastasia Pollack Crafting Mystery series. Tell us about it, Lois! Sometimes no matter how hard we try, things don’t work out the way we’d hoped. Back in late 2009 I signed a contract for the first three books in my Anastasia Pollack Crafting Mystery series. In the beginning, I was very happy. And my publisher was very happy. The books, the first of which debuted in January 2011, sold well and garnered great reviews, including starred reviews from Publishers Weekly and Booklist. I was looking forward to a long partnership. But things changed, and I suddenly became concerned by these changes. You know that uneasy feeling that you get in the pit of your stomach? That’s a warning left over from our prehistoric ancestors. It’s like the robot on Lost in Space who flailed his dryer hose arms and shouted, “Danger, Will Robinson!” If you’re smart, you listen to him. After several “Danger, Will Robinson” moments I made the decision not to sign a contract for any more books in my series and also turned down a contract for a new series. It was a huge decision and one I agonized over for a long time. I’d worked long and hard to become published, and now I was contemplating walking away from the legitimacy of being published by “real” publishers. However, in the end I knew in my gut that I was making the only decision I could make without allowing myself to become a victim. As Dear Abby used to say, people can’t take advantage of you if you don’t let them. Walking away from a publisher is like getting a divorce. Very rarely is it an amicable situation. Last August I received letters from my publisher stating they were releasing the print rights to Assault with a Deadly Glue Gun and Death by Killer Mop Doll, the first two books in the series, back to me. All remaining warehouse stock would be pulped. Pulped! The books had earned out within the first reporting period after release and were still selling moderately well. Plus, trade paperbacks are generally remaindered, not pulped like mass market paperbacks. However, although they were giving me back my print rights, the publisher insisted they had the right to keep selling the ebooks versions of each title. They didn’t. It was a clear violation of my contracts, and my agent began working to get those rights back. I’m happy to say, I finally have them. One of my biggest gripes with publishers in regard to ebook sales is the price many of them charge. My publisher still has the rights to the third book in my series. The trade paperback of Revenge of the Crafty Corpse sells for $14.99. The ebook on iTunes also sells for $14.99. On Amazon the ebook is currently discounted to $8.69. On B&N it’s selling for $10.49. I think this is outrageous. Ebooks require much less cost to produce, and there’s no overhead. There are no printing costs, no paper and ink costs, no warehousing costs, no shipping costs. One of the biggest complaints I’ve heard from readers is that the books are too expensive. I totally agree. We all have to keep to a budget. Food for our families, mortgage payments, and gas for our cars rightfully take precedence over ebook downloads. I certainly don’t buy as many books as I’d like to; therefore, I can understand readers who have limited funds to spend on books. 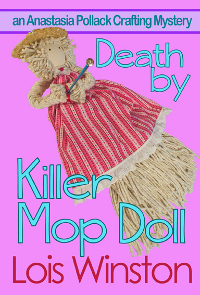 Since receiving back the e-rights to both Assault with a Deadly Glue Gun and Death by Killer Mop Doll, I’ve made them available as ebooks at the very reasonable price of $3.99. I hope more readers will now be able to discover and enjoy Anastasia, her oddball family, and her adventures as a reluctant amateur sleuth. I know they will, Lois! Visit Lois/Emma at www.loiswinston.com, and visit Anastasia at the Killer Crafts & Crafty Killers blog, www.anastasiapollack.blogspot.com. Follow everyone on Twitter: https://twitter.com/Anasleuth. A WRITING PROMPT FOR YOU: Do you have a craft or hobby? Does your main character? Drinking doesn’t count. This entry was posted in Writing. 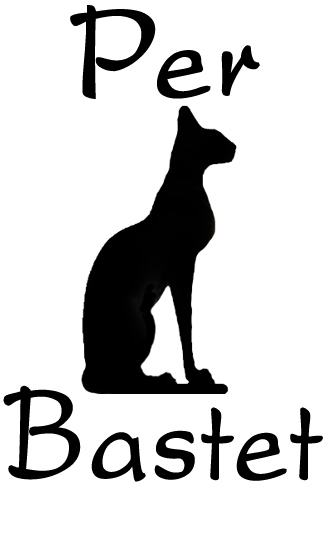 Tagged guest author, the writing life. Lois Winston: Best wishes. I sympathize greatly. Much has been litigated lately regarding those pesky high e-book prices. I just got a credit from Amazon because I had bought books that were over-priced (or price-controled). Not sure which. Legalease, you know. Oh, well, you know, Jane, drinking the way WE do it counts as a hobby. I’m talking about OTHER PEOPLE. Fully agree, there is no consistency in e-book prices. Sellers can charge anything they want, and the publisher doesn’t have any say in the matter. Wish you the best of luck in your struggles, something like David and Goliath. Thanks for stopping by, Rayne, and for your best wishes. Thanks, Jane. I haven’t received a credit from Amazon. I guess the books I bought during the period in question weren’t expensive enough to qualify. I don’t exactly recall either. but I DID purchase Patricia Briggs’ Mercy Thompson series. Great post and well-timed for me! I just got my rights back as well, and plan to start self-publishing my titles in April and May. It’s not always an easy process–though mine was…the contract was fortunately very clear on what my publisher and I could and couldn’t do, and when the time came I struck. But I agree. Reading is for entertainment and enjoyment and there’s a difference between reasonable pricing and outrageous pricing. And readers deserve to have an opportunity to choose from what is reasonable. Quite true, Terri. Thanks for stopping by and commenting. I too severed a relationship with my first publisher. After signing off on the copyedited version, said Publisher decided they didn’t care for how the book was edited. (It was their editor!). Then, in fact, pushed book out without me approving those new edits. I tried to let it go, but when they started editing the second book in the series the same way, I requested my rights back. Getting the rights back on the first book was a nightmare even thought the publisher had clearly violated the contract. I’m happy to say, that while it took several months it was worth it. Kathy, unfortunately, although we’re expected to adhere to the letter of the law on our contracts, we can’t always assume publishers will do the same. My experiences have turned me very cynical. Thank you for sharing your story, Lois. I’m glad to hear you were able to get your e-book rights back–wishing you wonderful sales ahead! Thank you for sharing your experience of getting your book rights back. I’m contemplating a similar decision, and you inspired me to take a closer look at requesting the rights back on two of my books. They’re only offered in eBook format and that won’t change at my publisher, but the bigger concern is their prices have never changed from the “boom town days” of digital publishing when people paid those higher prices without even blinking. (Example: my 65k romance has never changed from $6.99) 0_o I would hesitate to spend that much on my own book given the current eBook pricing trends. Kaye, I can’t imagine that your publisher is selling very many of those 65K romances at 6.99! You’d undoubtedly make a lot more money if you put them out yourself at 2.99. Good luck! The more stories I hear like this, the more I’m happy with my decision to self-publish. Lois, I love the premise for your books! If your writing is as funny as your titles, they’re bound to be hilarious! Cathy Olliffe-Webster would love to share..I’m a minion! Crafty Lois, Congrats on making that tough decision! I’m not a crafter myself, but I cruise the State Fair crafts building every summer. Same thing that used to bore me senseless when my mother did it when I was a little girl! Thanks, Greta! Isn’t it amazing how our perspectives and tastes change from when we were kids? No kid wants to be dragged around a crafts fair, but as adults, whether we’re crafters or not, we can appreciate the beauty and workmanship that goes into each craft piece. I don’t quilt. It bores me to tears, but I love quilts and have collected quite a few at craft fairs over the years. My publisher sublicensed my ebook and trade pb rights for my earlier mysteries. The prices are okay for these editions but the covers are awful. Despite my pleas, they wouldn’t change them. This company has now been taken over by another. I doubt things will be different. Nancy J. Cohen would love to share..Hello world! So sorry to hear that, Nancy. Yet another reason to take complete control of your career. I agree. If only we knew then what we know now, but back then, all these career choices didn’t exist. That’s because back then self-publishing was a desperate option and poorly done. Not so today, at least by seasoned authors or those smart enough to hire editors. Yes, sometimes change is good!